Elkins is one of those towns in West Virginia that is just super quirky, fun, artsy and has a ton of great food. 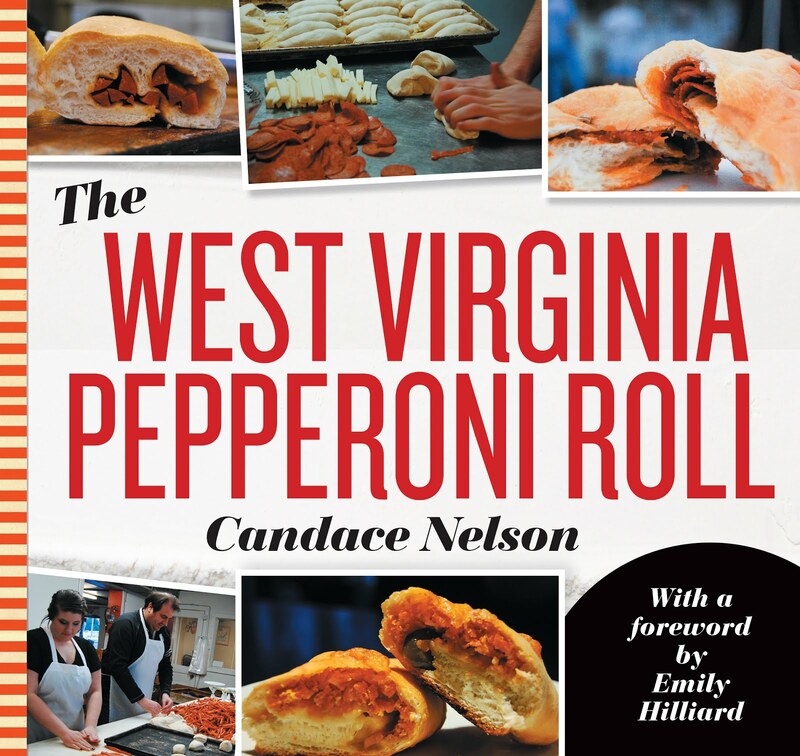 That's why there were a few restaurants located in Elkins that were voted as the 101 Most Unique Places to Dine in WV. That's what brought me to Smoke on the Water BBQ in Elkins. The BBQ restaurant is housed in a log-cabin-esque building situated next to a creek that happened to be roaring that day. 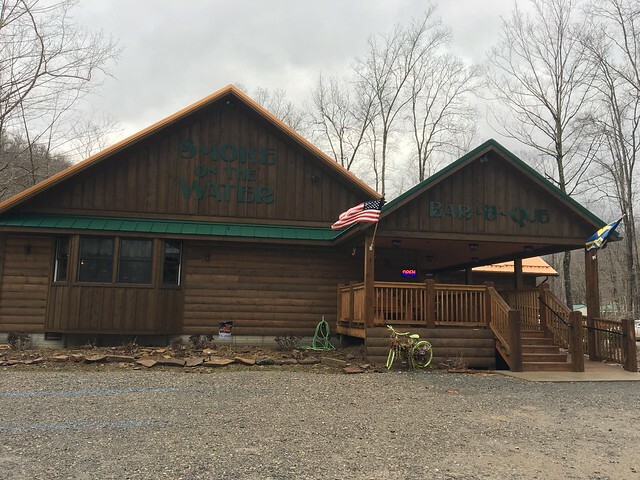 Smoke on the Water was established in 2011 by native Jon Magee, a longtime resident of the river and avid trout angler, to provide unique and delicious food prepared in the laid back style that embodies river living. 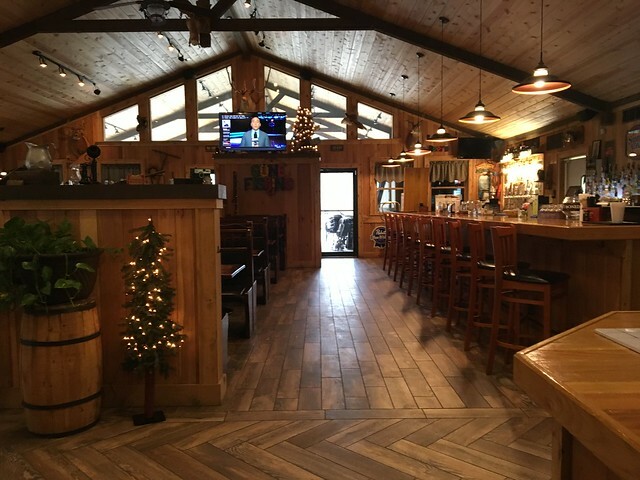 Jon and his wife Denise have a passion for great BBQ and a desire to provide everyone who enjoys the surrounding mountains a place to relax, while we prepare you a unique taste experience to enjoy at your leisure. 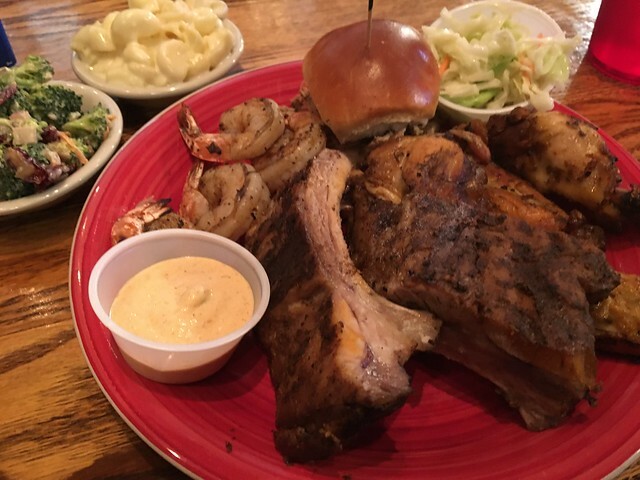 All our food is cooked using traditional BBQ methods and many ingredients are also smoked to provide a unique flavor in traditional BBQ favorites. 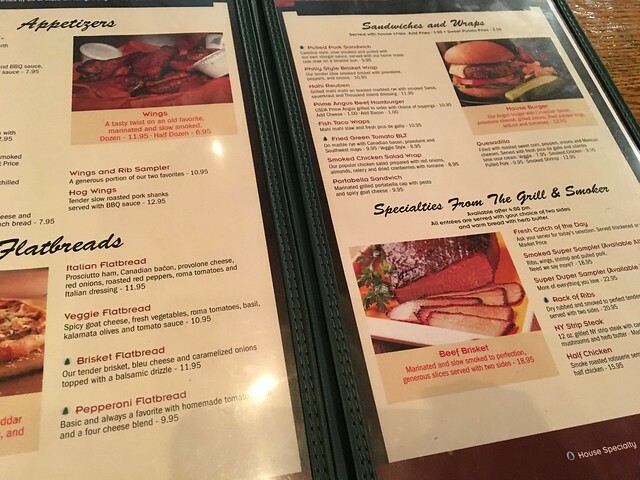 Stop in and visit our BBQ Restaurant in Elkins, WV today (read more about the restaurant here). Walking in, I noticed it had a bit of an odd smell - mildew, maybe? Reminded me of a bar that had been busy the night before and hastily cleaned up to be presentable for serving food the next day. Save for that, the space is fairly large - wooden floors, booths, ceilings - everything. High ceilings with wooden beams helped light flow through. The booths are wooden and not super comfortable, but since it was just me, I sprawled out and made myself at home. I looked over the menu, and the "Smoked Super Sampler" seemed like the obvious choice. 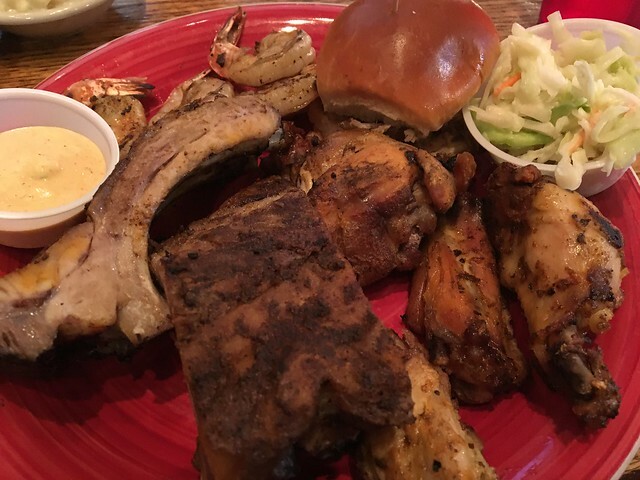 It was available all day and came with ribs, wings, shrimp and pulled pork. PLUS two sides, which I opted for macaroni and cheese and broccoli salad. They weren't joking when they called this "Super" because it's a good amount of food! 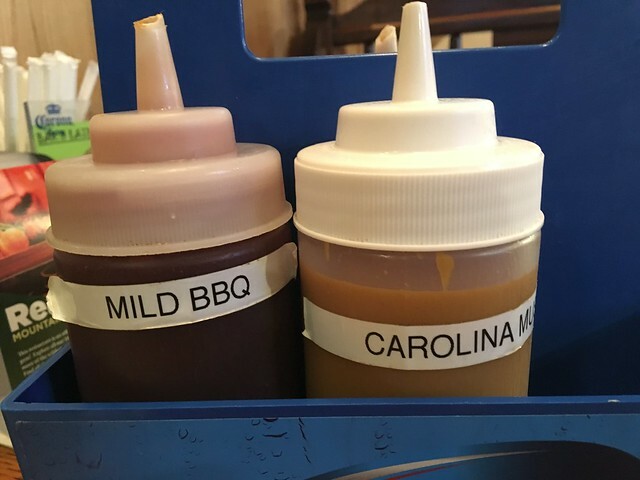 I first got small bits of each BBQ sauce that was on the table so I could try: spicy bbq, river sauce, mild bbq and Carolina mustard. 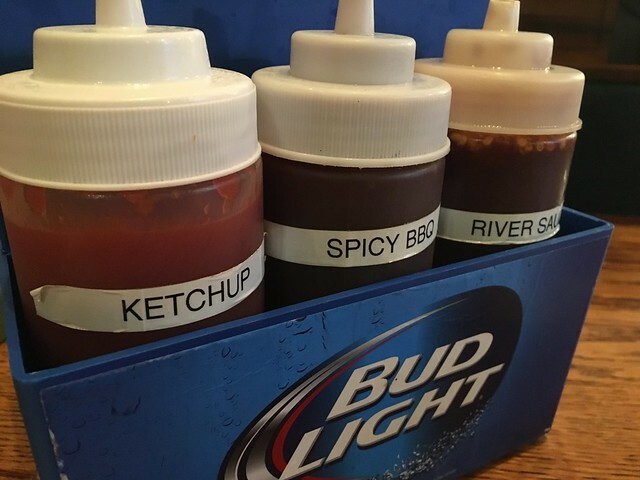 My favorite was the mild bbq, because I'm a wimp, I guess. It was OK - pretty standard. The giant display of food was something! Let's start with the shrimp - these were smokey and served with a remoulade sauce. That was different, but it was also tasty. The one pulled pork slider was probably my favorite because it had some good smokey flavor, tender pork (no fat!) and I could slather all the BBQ on it that I wanted. The chicken wings up in the top right were large, but I can't say smokey chicken wings are my favorite. The skin is a bit too fatty for my liking. The ribs were good - if not quite as tender as I'd like. Overall, I think it's a solid platter. I wished there was brisket, and I appreciate how deep the smokey flavor is. I think a few small adjustments could take this up to the next level.